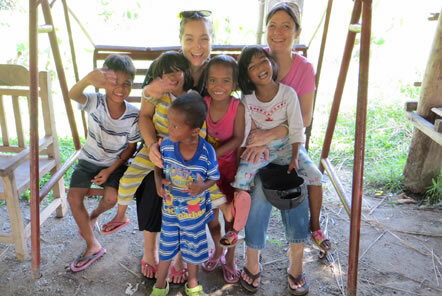 Placement Manager, Becky, tells us of her experience visiting the Rural Children's Home in Cambodia. 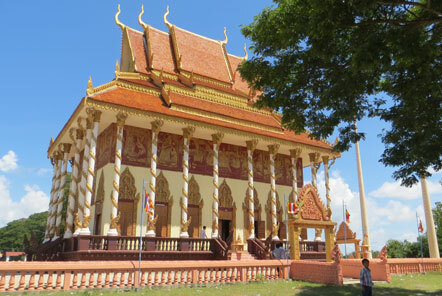 "Driving out from Phnom Penh the city disappears quickly as you transfer from the buzz of the capital to an open rural road, surrounded by paddy fields and the odd small manufacturing building. The main road which the Children’s Home is situated on, runs from Phnom Penh to Sihanoukville and as such it is busy with long distance traffic; turn left or right off of this road however and you are met with a very different Cambodia. In Kampong Speu Province the main economy remains largely agricultural with the region being known for its palm sugar and palm wine whilst it also produces a high amount of mangoes and watermelons and fish from local fish farms. It is a stunningly beautiful region of Cambodia with huge open skies and bright green fields. 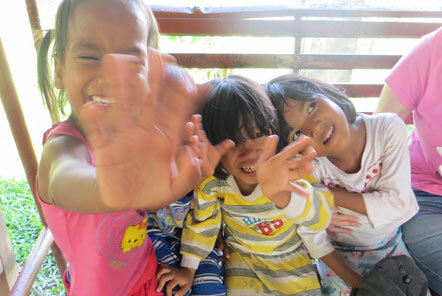 Around three hours after departing Phnom Penh we arrived at the Children’s Home. On arrival you are immediately welcomed by a rabble of children, rather excited to see a new face and keen to practice some English which for the little ones is primarily “hello” and “what is your name”. Whilst the arrival is daunting with many new faces, it is undoubtedly one of the warmest greetings you could ask for! I arrived at the Children’s Home in the middle of Pchum Ben Festival – the Festival of the Ancestors and a time for all Cambodians to visit family and pay respect to their elders. The festival is the second largest in Cambodia (behind Khmer New Year in April), businesses close on the final days of the festival and schools can be closed for anything from 1-3 weeks depending on the decision of the teachers. It was an exciting time to be in Cambodia with Buddhist Ceremonies across the country. It meant the Children’s Home was very busy with many of the local staff eager to visit their own families – in particular the nannies who live on site full time away from their families. For these periods each year, late September and mid-April, volunteers are even more valuable to the team. Lunch and dinner is included for volunteers and almost every dinner is rice based - it's far from uncommon in Cambodia! In the mornings however volunteers are free to pop into the village for their breakfast or cook their own in the Volunteer House. I preferred to make my way into the market; it’s an amazing local market with so much fresh fruit and vegetables. 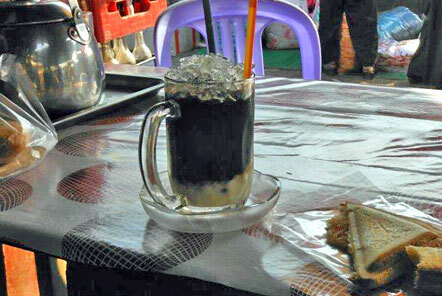 An iced coffee (Kafee dok-dah-koh) and fresh bread was the perfect breakfast but for a treat I sometimes also purchased banana sticky rice, straight from the grill and wrapped in a palm leaf (left), it is the best treat! On the final day of Pchum Ben, I was invited to visit the local temple with the older children from the Children’s Home and Sunny, the Director of the Home. Visiting the temple at Pchum Ben was a very big event, whilst some families may visit the temple regularly some also go only once or twice per year and Pchum Ben and New Year. Approaching Sama Samput Toh Temple around mid-morning already very busy with visitors, many families met together outside before heading inside to give donations, receive a blessing and celebrate the day with friends and family. Everyone we met was dressed smartly – in the equivalent of the “Sunday Best” – and children were often in their school uniform or a special outfit for the occasion. Visiting with the older boys from the Children’s Home who were aged between 14-19 was particularly nice for me as I was able to learn more about the Temple and the culture, whilst they also had to practice their English to answer my many questions! 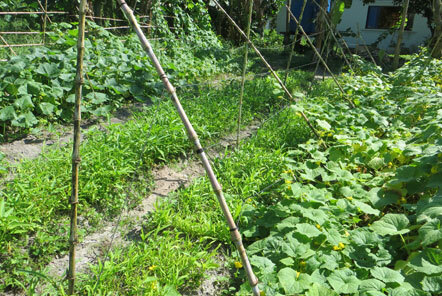 The Children’s Home itself is based within 7 hectares of rural tropical farm land and consists of a number of small buildings all based around a green grassy area with a playground for the children – however in wet season this grass can grow so long each week that it can be difficult to maintain! The farmland makes up the majority of the rest of the site and whilst some is currently operational and producing crops, other parts of the land are still wild and are on the waiting list to be cleared, ploughed and planted when the project have the hands and/or resources to do so. Currently on site they are growing cucumber, morning glory, tomatoes, radish and a variety of fruit including banana and mango. Although the project is based just minutes from a main road, the location is remote. The Children’s Home has no internet access, electricity can be intermittent and travel in the local area can be challenging without prior planning. For me this was part of the beauty and charm of the project, the location and remoteness allows you to immerse yourself if rural life and experience the real Cambodia (the night sky was one of the best I have seen) and the quiet evenings give volunteers a chance to relax and unwind. For the older children, the impact of volunteers is evidently seen in the interaction and communication skills. Many of the older children are very mature and although the English level varies, some are already outstanding in their vocabulary. The lessons that volunteers teach gives the children confidence however even on a daily basis, having the opportunity to practice and ask questions and chat to volunteers improves their pronunciation and grammar – as does “Let It Go” from Frozen which they almost know every word to! Unfortunately my stay came to an end all too soon however it was great for me to get to know the children but also the Khmer staff who I am not able to communicate with on a daily basis from the UK. The Children’s Home have an amazing on site team including the wonderful cook, Kim-Eng the nurse and the friendly farm team including Ratthena who has recently been working alongside our volunteers on the farm." 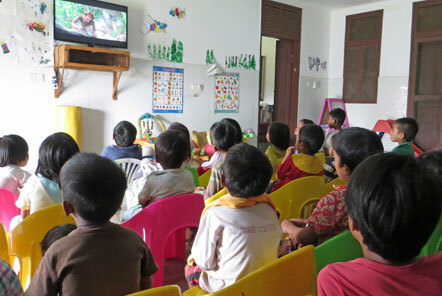 We look for volunteers to join this project to help with education, child care and farming activities on site but in addition to this the Children’s Home are always eager to find volunteers with other skills they can lend such as vocational skills, DIY/building, language skills (particularly Chinese) and specialist areas such as Physiotherapy. Becky is the Placement Manager for the Children's Home in Cambodia. She joined Pod Volunteer in 2011 after volunteering in Nepal at the Child Care placement and since then has visited Cambodia twice, visiting Takeo, Kampong Speu, Phnom Penh and Siem Reap and our placements in Peru.